Do You Want To Know A Secret? Sixties star Billy J Kramer was given the initial in his name by his late great pal John Lennon - but he’s now revealed what it stands for. The J, which Lennon told him would be a hook for fans to remember him by, actually stood for Julian, after The Beatle legend’s then baby son. Billy, real name William Howard Ashton, admits he actually wasn’t too keen on the name but he went for the inital. And it certainly got him notice. The same month Julian was born - April 1963 - Billy J Kramer and his band The Dakotas had their first big hit with the Lennon and McCartney penned Do You Want To Know A Secret, which reached number two in the single charts. Billy, now aged 71, back in the UK for his first British tour for 18 years, also got a life changing 20th birthday present from his mate Lennon.Sat at the piano in Abbey Road he played him Bad To You, which became Billy’s first number one. The fascinating stories trip of the tongue of the Merseybeat star who will be delighting fans with news songs from his latest album, I Won The Fight and iconic hits such as his band’s other number one Little Children, I’ll Keep You Satisfied, From a Window and Trains and Boats and Planes. Billy, now with his band The Rising, is headlining a 30-date Solid Silver 60s Show, with support from Mike Pender, the original voice of Sweets For MY Sweet stars The Searchers, Angel Of The Morning hit maker PP Arnold, Chris Farlowe and special guests, The Merserybeats. All seminal artists from the era. The show plays Sheffield City Hall on April 2, 2015. Billy, who was managed by The Beatles manager Brian Epstein, revealed: “I went under the name of Billy Kramer. John Lennon gave me the J. He said it would be more of a hook for people to hang onto. “But it’s not J for John. It was actually Julian. I didn’t know he was married with a son at the time. I said I wasn’t really keen on the name. But the initial worked. He told how he got a birthday to remember thanks to Lennon. He said: “Of all my hits, my favourite is Bad To Me. John was backstage and he said he had a song for me. I asked if he would play it but he said no, he wanted me to go to Abbey Road. They were becoming so popular, I didn’t think he would show. But at 10am he turned up, sat at the piano and played Bad To Me - on my 20th birthday. “He then said I want your honest opinion on this next song. It was I Want To Hold Your Hand. I said ‘can I have that one’. He said ‘no, we’re doing that one ourselves’. He added: “I think the Sixities is the greatest period in pop history that has ever existed and is every likely to. Nothing has compared with it, before or since. While he’s not been touring in the UK he hasn’t been out of showbiz. He has been busy performing in America, where he now lives, and narrating audio books. But he’s not forgotten his Merseyside roots. His latest album I Won The Fight is semi-autobiographical, including the title track about his early days as a railway worker. To Liverpool With Love is about his successful campaign to get Brian Epstein inducted into the Rock and Roll Hall of Fame. Billy said: “I sent Paul the song, To Liverpool With Love and he congratulated me. He said ‘you really captured the moment’. “From time to time, when Ringo does his all star show he gives me a call and I go down and see him. I’ve also been to a few of his art shows. * Tickets for The Solid Silver 60s Show at Sheffield City Hall on Thursday, April 2, are £26 each, may me subject to fees. 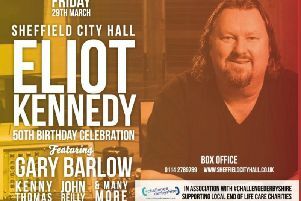 Buy in person, call 0114 2789 789 or visit www.sheffieldcityhall.co.uk.